This 16-18 hour course is for individuals who wish to climb trees recreationally. During the course, you will learn to climb large trees by using a style of climbing called Double Rope Technique (DRT). 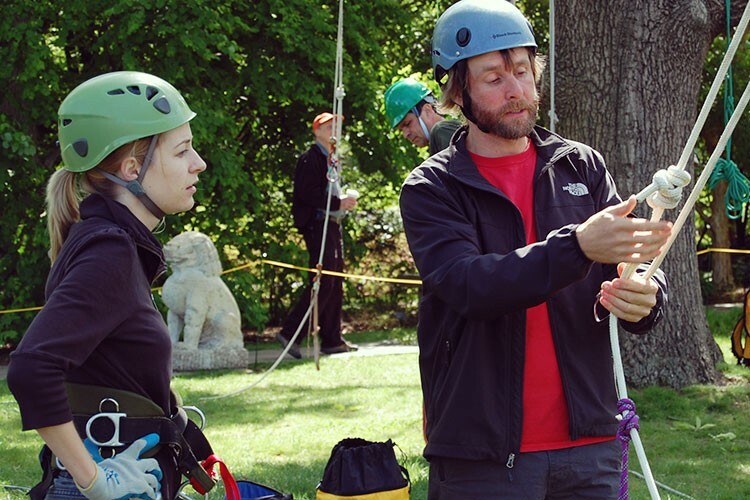 You will learn how to select trees and install and set up a DRT climbing system. This is a hands-on course. Much of the time will be spent tying knots and practicing skills. We will cover what gear you need and how to select the proper equipment for your climbing goals. This is the perfect course for tree workers wishing to learn new and more efficient climbing techniques and recreationalists interested in exploring large trees. Price includes tree climbing book, Vertical Voyages course manual, and 20% discount on a Basic Tree Climbing Kit. This kit is not included in the tuition price. All tree equipment is included for use throughout the course.